TASHKENT (ALSO TOSHKENT) is the capital of the Central Asian republic of UZBEKISTAN, which gained its independence when the Soviet Union was dissolved in 1991. Located on the banks of the Chirchik River in the Kyzlkum desert and the foothills of the TIAN SHAN/Pamir mountains, Tashkent is an oasis with a population of about 2.3 million. It enjoys a continental desert climate with an annual range of temperature between 21 degrees F (-6 degrees C) and 91 degrees F (33 degrees C ) and a low annual precipitation of less than 15.7 in (40 cm). 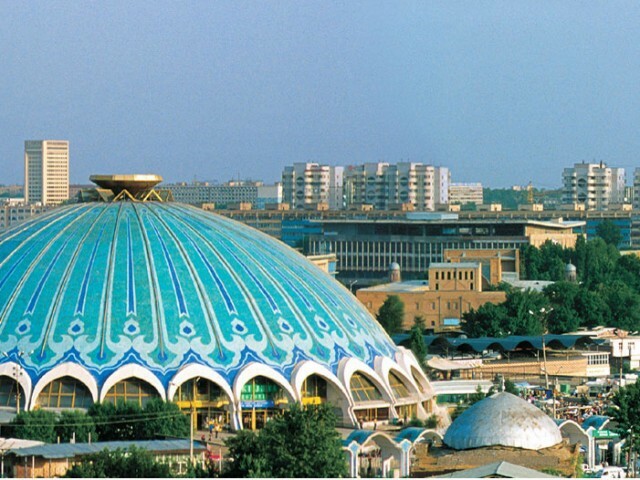 Nevertheless, it remains a green city with many parks and gardens: Tashkent receives meltwater from its mountain hinterland, also a source of water for the Syr’darya River, which supplies the ARAL SEA and the extensive regional agriculture, which focuses on cotton. Founded about 200 years B.C.E., Tashkent has benefited from its position at the crossroads of Asia and has been influenced by many invaders and visitors. It developed under the influence of the Sogdians from the east, and nomadic Turkic peoples during the 7th century by which time irrigation was extensive and provided crops and livestock for trade. In 751, an attempted Chinese invasion was thwarted by competing Arab invaders, who won the day. ISLAM was firmly established as the dominant religion. As in BOKKARA, the Samanid dynasty prevailed in the 9th century when the city was known as Binkath. It was a thriving trading and religious center until the early 12th century, when the Mongols, under Genghis Khan, destroyed the city. Subsequently, Tamburlane and his successors oversaw a revival and a new building phase. Despite conflicts of interest between local ethnic groups, Tashkent grew as a trading center and came under the influence of, first, tzarist Russia in the late 1800s, and then the communist regime from 1918. Some destruction of mosques occurred but the impact of the Russians was slight compared with the earthquake of 1966 that destroyed much of the city. The modern city is a combination of Russian-style tree-lined boulevards with numerous green squares with fountains, parks and concrete tower blocks and the surviving old quarter with its Uzbek influence. Tashkent, superseding SAMARQAND, became the capital of Uzbekistan in 1930. It is not only an administrative center for the newly emerged state of Uzbekistan of the post-Soviet era but also a trade and cultural center with many museums and theaters with a reputation for excellence in ballet and opera. Its squares have lost many statues of communist leaders and there is an efficient metro system constructed between 1972 and 1977. Museums abound. In old Tashkent, there remain pre-1966 mud-built dwellings juxtaposed with a new Islamic University signifying the re-emergence of Islam.